(Colorado Springs, Colo.) – The USA Fencing Team had one of its most successful Senior World Championships in 2013 and Team USA’s medalists will be back for more in Kazan, Russia from July 15-23. Individual preliminary rounds will take place from July 15-17 for athletes ranked outside the top 16 in the world. Direct elimination rounds from the table of 64 on will be held from July 18-20 and team competitions will take place from July 20-23. Last year, history was made as foil fencer Miles Chamley-Watson (New York City, N.Y.) became the first U.S. man to win an individual Senior World title. Chamley-Watson wasn’t alone in the hardware haul as he and his men’s foil teammates won silver in the team event and the women’s saber team took bronze for the third straight year. 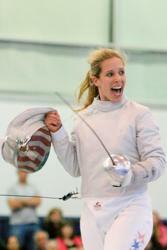 In January, Meinhardt became the first U.S. foil fencer to be ranked No. 1 in the world as an individual and he followed a successful 2013 season with three individual medals on the international circuit this year. Meinhardt followed his bronze at the Paris World Cup in January with a gold at the Tokyo Grand Prix in May where he became the first U.S. men’s foil fencer to win a Grand Prix gold. In June, the Notre Dame MBA student defended his 2013 Pan Am title to hold onto a No. 3 world ranking behind Jianfei Ma (CHN) whom Meinhardt defeated in Tokyo and Enzo Lefort (FRA) who edged Meinhardt on home soil in Paris, 15-14. Massialas, a sophomore at Stanford who is ranked seventh in the world, had a strong second half of the season in which he won two medals in May, claiming a gold at the Seoul World Cup and taking bronze in Tokyo the following weekend. Massialas was back on the podium again in June when he took silver at the Pan Ams. Though Imboden’s world ranking fell from No. 2 to No. 13 this season, that number remains deceptively low as he took silver in Seoul and bronze in Tokyo where the Americans earned three spots on the podium at a Grand Prix event for the first time in the history of men’s fencing in the United States. As a team, the U.S. men’s foil squad won a trio of bronze medals this season and took two wins over Italy, the reigning World and Olympic Champions. Team USA will come into the Senior Worlds ranked fourth which means the 2013 final between Italy and Team USA won’t occur as the two teams could meet in the semis in Kazan with France and Russia on the opposite side of the bracket. Saber fencer Mariel Zagunis (Beaverton, Ore.) remains the most decorated U.S. fencer in history with four Senior World titles and two Olympic golds to her credit. Now ranked No. 2 in the world, Zagunis is hungry for a return to the individual podium she stood on in 2011 when she won a silver medal. Zagunis and World No. 1 Olga Kharlan (UKR) split their only two match-ups this season when the two fenced back-to-back weekends in February. Each of Zagunis’s teammates from the 2013 Senior Worlds will be back this year and all three have won individual medals on the World Cup circuit in 2014. A bronze medalist at the Gent World Cup in February, London Olympian Dagmara Wozniak (Avenel, N.J.) has earned top-eight results in her last five appearances on the circuit, including a bronze medal result at the Pan Ams where her only loss came to Zagunis. Wozniak’s consistent results have earned her a No. 6 position in the world rankings. Fencing at her second Senior World Championships, Eliza Stone (Chicago, Ill.) only began competing on the World Cup circuit for the first time in 2013, but she now has two individual medals to her name after third place finishes in Dakar in February and Moscow in March. Ibtihaj Muhammad (Maplewood, N.J.) also finished third in Moscow and ended the circuit with a bronze medal at the Pan Ams in Costa Rica. The three-time Senior World Team medalist should come into the individual event as a 13th seed. The U.S. Women’s Saber Team is ranked third in the world rankings behind host nation Russia and Ukraine, the reigning Senior World Champions. Team USA defeated both nations en route to winning gold at the Antalya World Cup in March and finished the season with a silver medal at the Absolute Fencing Gear® Korfanty World Cup in May and gold at the Pan Ams in June. Two members of the women’s foil squad are ranked in the top 16 and London Olympic teammates Nzingha Prescod (Brooklyn, N.Y.) and Lee Kiefer (Lexington, Ky.) have each won international medals this season. A bronze medalist at the Pan Am Championships, Prescod won silver at the first Grand Prix of the season in Gdansk and is now ranked 10th in the world as she prepares for her senior year at Columbia. Prescod’s lone loss at the Pan Ams came to her teammate, Kiefer, a Notre Dame sophomore, who won gold in Costa Rica after a season that included gold medals in both individual and team at the Junior World Championships in April. A sophomore at Columbia, five-time Junior World medalist Margaret Lu (Greenwich, Conn.) will be fencing at just her second Senior World Championships, but Lu is a veteran of the Senior World Cup circuit after making her European debut as a 15-year-old in 2010. In the team event, the U.S. women’s foil squad earned top-eight results in three of the four World Cups in which the Americans competed this season. Team USA is ranked sixth in the world and the trio of Prescod, Kiefer and Ross will be joined by Sabrina Massialas (San Francisco, Calif.) who has fenced in team events on the World Cup circuit for the last two seasons and served as the anchor for the Americans when the ladies won gold at Junior Worlds this year. Epee fencers Courtney and Kelley Hurley (San Antonio, Texas) each had breakout seasons this year with Kelley winning the squad’s first individual medal at a World Cup in 10 years with a bronze at the St. Maur World Cup in March and Courtney taking silver at the Havana Grand Prix in May. Courtney followed her silver in Cuba with a gold at the Pan Ams that propelled her into a career-high No. 6 world ranking. The London Olympic team medalists will be joined by two-time Junior World medalists Katharine Holmes (Washington, D.C.) and Anna Van Brummen (Houston, Texas). This is the second Senior Worlds for Holmes who earned a top-32 result in 2013 after a one-touch overtime loss to 2012 Olympic medalist A Lam Shin (KOR). Van Brummen, who fences with Holmes at Princeton, made her senior international debut this season with two top-32 results as well as a bronze medal finish at the Pan Ams. The U.S. Women’s Epee Team won bronze at the 2012 Olympic Games and, after three top-four finishes at World Cups this season, could be poised for a return to the podium in Kazan. The men’s saber team continues to be led by Daryl Homer (Bronx, N.Y.) who finished sixth at the London Games. Homer earned a trio of top-eight results this season and will enter Senior Worlds as the No. 12 fencer in the world. Homer’s London Olympic teammate, Jeff Spear (Wynantskill, N.Y.), will be fencing in his second World Championships. Spear earned four top-32 finishes as an individual on the World Cup circuit made strong team contributions this season as the squad’s back-up anchor. A three-time Junior World medalist and incoming Harvard freshman, Eli Dershwitz (Sherborn, Mass.) won his first senior individual international medal at the Pan Ams where he took gold. Ben Igoe (Staten Island, N.Y.) will be making his first return to the Senior Worlds since narrowly missing the 2012 Olympic Team and is expected to bring a wealth of experience to his fourth appearance at the event. This year, the men’s saber team won its first World Cup medal since 2012 when the squad claimed wins over Belarus, Hungary and Italy en route to taking silver at the Madrid World Cup. Homer, Spear and Dershwitz will fence in the team competition with Andrew Mackiewicz (Westwood, Mass. ), an incoming Penn State freshman, who was a member of the team that won gold at the Pan Ams in June. Following the retirement of several veteran fencers from the U.S. Men’s Epee Team, the squad includes a quartet of young athletes who are eager to make their mark in Kazan. Adam Watson (Richfield, Vt.) and 2013 Pan Am medalist Jason Pryor (Colorado Springs, Colo.) are both returning members of the 2013 squad and will fence with first-team member Jimmy Moody (Colorado Springs, Colo.) and Andras Horanyi (Colorado Springs, Colo.) Horanyi may be a new face to his epee opponents, but this is the fourth Senior World Team appearance for the former foil fencer who opened the season with a top-16 result at the Doha Grand Prix and placed eighth at the Buenos Aires World Cup in May. Although the team had a difficult start to the season, the U.S. Men’s Epee Team finished the circuit on a strong note with a fourth place result in Buenos Aires and a bronze at the Pan Ams. Start lists are available at www.fencingworldwide.com. Live results also will be updated on that site throughout the tournament.